This story could start with a Craigslist job ad being answered in early June. But really, it began years before that. Chris Hoffman, St. Vincent de Paul’s head chef, is not here by accident. 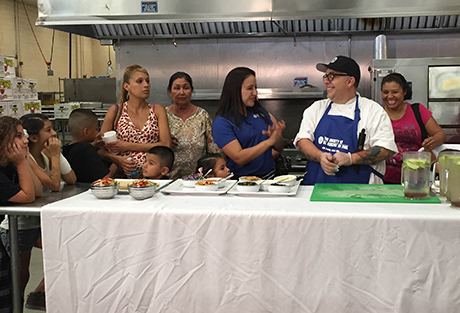 SVdP helped Chris and his family several years ago, and when he saw the ad for a head chef pop up on Craigslist, he knew it was where he needed to be. Born and raised in New York, Chris started his love affair with food at an early age. “While I was in high school, my mom was always working, so I cooked a lot at home. I wasn’t a gourmet cook or anything, but I had an uncle I was very close to who was a Catholic priest and a big foodie. Whenever I stayed with him, he was always cooking good food, and it got me interested,” Chris said. After graduating from culinary school, Chris began working in several different restaurants. His most exciting gig came in 1999. He applied to be a chef at the Ritz Carlton in Jamaica. He got hired, moved to Jamaica and met his wife. After three years, they decided to move to Arizona. Unfortunately, the job market in Phoenix was not so great in 2002 and Chris’s daughter was born at the same time. That’s when Chris decided to call St. Vincent de Paul. Corpus Christi, the food pantry closest to him, helped him with rent, food boxes and signed his family up for the holiday Adopt-A-Family program. After being out of work for six months, he landed a job at The Phoenician, a prestigious resort in Phoenix. He worked there for ten years. After The Phoenician, he did a two-year stint as sous chef at Lone Butte Casino until June of this year. That’s when he came across the Craigslist ad for SVdP’s head chef position. On his first day, Chris walked over to Sister Carmel, one of the staff members who had helped him previously. He let her know he was working here now and thanked her for what she did to help him during his time of need. Today, if you were to follow Chris around the kitchen, you’d have to keep up. As head chef, Chris is responsible for sorting through food donations, planning menus and running a kitchen that serves 4,500 meals a day. This meal count includes SVdP’s valley-wide dining rooms. Despite his tremendous workload, if you asked Chris, it’s still not nearly as stressful as other chef positions he’s held. Chris wants to start bringing in his daughter and nieces and nephews to volunteer in the family dining room, so they can see that life isn’t perfect for everyone. Do you want to volunteer in our kitchen or dining room? We’d love to have you! Visit our Volunteer page to learn more or sign up today.